Slotted Urethane Wheels are one of the numerous polurethane products that can be used for diverse applications. The slotted urethane wheels manufactured at Plan Tech are made from only the very best of raw materials produced by globally recognized chemical companies. Facility: At Plan Tech, we boast a state of the art in-house cast polyurethane facility and machine shop that is second to none in the United States. Our facilities are well equipped with sophisticated machineries that allow our technicians and engineers to produce urethane products that are of unbeatable quality. Technicians: There is no arguing the fact that the sector has a lot of engineers at its disposal; however, our team of technicians boasts an unusual degree of technical expertise that set them apart from other engineers in the sector. Shrink rates and tight tolerances are our specialties. Experience: Plan Tech is a company that has been in the businesses of manufacturing top quality urethane parts for over three decades and counting. Thus, we are a richly experienced group that can turn simple urethane ideas into perfect finished products. It, therefore, isn’t a surprise that we are the go-to cast polyurethane company in the industry that can meet high volume demand of slotted urethane wheels in record timing without compromising quality. 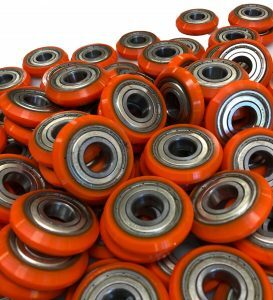 Our slotted urethane wheels are renowned for their remarkable resistance to chemicals, abrasion, corrosion as well as extreme weather conditions, etc. And with our wheels, you can be certain of maximum durability. Whether you are a start up company or global leader, we can add value to your products with our strong engineering support, urethane polymer experience and constant focus on meeting all delivery requirements. Our rapid prototyping capabilities have also received particularly positive feedback – we frequently go from “Print to Part” in 10-15 business days! Everything we manufacture is MADE IN THE USA! Are you interested in cast slotted urethane wheels? Please Contact us so we can help solve your requirements and work with you on your specific application!